Since starting my gardening business in Norfolk, I’ve been overwhelmed by my friend’s and family’s support and advice. My lovely friend Pru suggested a few ideas for my monthly articles. It made me think about going back to my childhood, making mud pies and sowing seeds with my Grandad, very happy gardening days! March is also a good time to consider lawn care for the spring. Don’t start it too early but certainly consider the options now for a health, strong lawn this coming summer. March is about having fun in the garden, enjoying your outdoor space and the promise of longer days and sunshine. It’s a month of new growth and spotting what’s good and what’s not good in your garden. Hoe, dig, pull up by hand, however you get rid of them, do so now. Time spent dealing with them now, while they are tiny, will make summer all the easier. If you haven’t already, order your plug plants now. You can also start sowing annuals directly in the ground, so long as it isn’t frozen. It’s a great way of filling gaps in your borders. You’ve still time to sow sweet peas direct or in pots, for an amazing summer display. 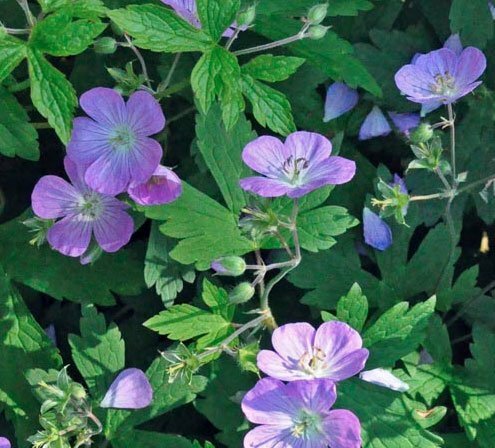 Early spring is an ideal time to plant herbaceous perennials, including Geranium, Astrantia and Oriental poppies. Large perennials can also be divided at this time, great new plants for free. It is best to get supports in early, so that the plants grow up through them, covering them discreetly. Adding rigid supports afterwards usually looks unattractive and results in bunched stems. Criss-crossing strings from hidden or decorative posts work well, allowing stems to grow up in the gaps between strings. If you’ve sown green manure, now is the time to dig it in. Sow carrots and lettuces under cloches and plant raspberries if you have room. Finally, if your lawn is looking rather long due to the warm, wet January, it is fine to mow on a dry day, ensure the blades are set high.